When Sun Sath heads out into the countryside in Svay Rieng province, his patients greet him as a trusted friend. Sath, 51, was the Svay Rieng team leader of the Cambodian Health Committee’s tuberculosis program for more than a decade. These days, he is leading the CHC AIDS programs in Svay Rieng and Kompot provinces, providing treatment to 3000 people and overseeing the Svay Rieng clinical site for the CHC-run CAMELIA trial, the first-ever clinical trial of the timing of combination treatment for TB and AIDS in the world. Sath’s bed-side manner is tender and caring, and he has come to know his patients, their community and their needs better than anyone. The residents of Svay Rieng have seen his commitment, and return the affection. Sun Sath on home visits of TB patients in Svay Rieng. Sun Sath’s life story is sadly common to many Cambodians of his age. As a young man living in the western province of Battambonge during the Pol Pot regime, Sath watched as five of his six brothers and sisters died of starvation. His only surviving brother, a soldier, died trying to help a peasant who had just been injured by a land mine. As the brother approached, a second mine exploded, killing him. With no family, no job and nothing to eat, Sath endured slave labor conditions under the Khmer Rouge and eventually, at age 25 made his way to a refugee camp on the Thai-Cambodian border. Even in these dire conditions, once in the camps, Sath was interested in learning about health, and in helping the people in his community who were suffering from poverty and disease. In 1982, he seized an opportunity to study nursing in the camps, in a program sponsored by the American Refugee Committee (ARC) (ADD LINK to ARC). Following a stint working as a pediatric nurse, he went on to complete ARC’s medical assistant training at the Site II South camp. 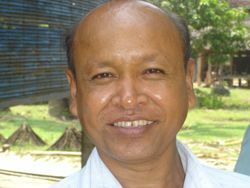 It was while working with ARC at the border that Sath met Sok Thim. Later, when Thim co-founded the CHC, he recruited Sath as one of the organization’s first staff members. Sath’s patients know him well, because they see him often. As head of the TB program, Sath was responsible for intensive monitoring and follow-up of patients in their homes and for the education of health workers that is the signature of the CHC approach. Sath and his staff were guided by the “four R’s”—their job is to see that the right patients receive the right dose of the right medicines at the right time. By their efforts, patient adherence to the rigorous TB treatment regimen and cures have reached more than 95 percent in this program. This is a critical number, because high adherence and cure rates are essential to successful treatment, and help avoid the rise of drug-resistant tuberculosis strains. Close contact with patients and their families and communities also provides the chance to treat new cases early, and educate about disease prevention. In 2004, Sath was promoted to health program director and head of the Svay Rieng Provincial Hospital CHC-led HIV/AIDS clinic. That work grew out of requests from TB patients for AIDS testing and treatment, which led to the CHC starting one of the first AIDS treatment programs in Cambodia, and the first in a rural setting. Sath now heads that program, which stared out with just 36 patients in Svay Rieng and has expanded to cover two provinces. His TB patients miss him, but his experience and commitment to building a care infrastructure in that program have made him a key organizer of the AIDS effort. Between caring for his patients, and raising his own four children, Sath has continued his education, too. It’s another sign of his commitment to the health of his community that Sath has been a part-time student for eight years, pursuing his MD degree on weekends after a full week’s work. Last year he officially became Dr. Sath, but to his patients he has been a medical savior for years.